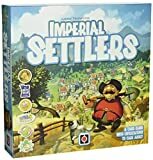 Your goal in a solo game is to build more Faction Locations in your Empire than the virtual player collects cards during the 5 rounds of play. During the game, track your Victory Points scored just like in a normal game. If you defeat the virtual player by building more Faction Locations, use your Victory Point score to track your high score. Use only one Faction, the one you choose for yourself. Take the 16 Attack cards, shuffle them and place them in a face down stack opposite to your Empire. Reveal the top Attack card. 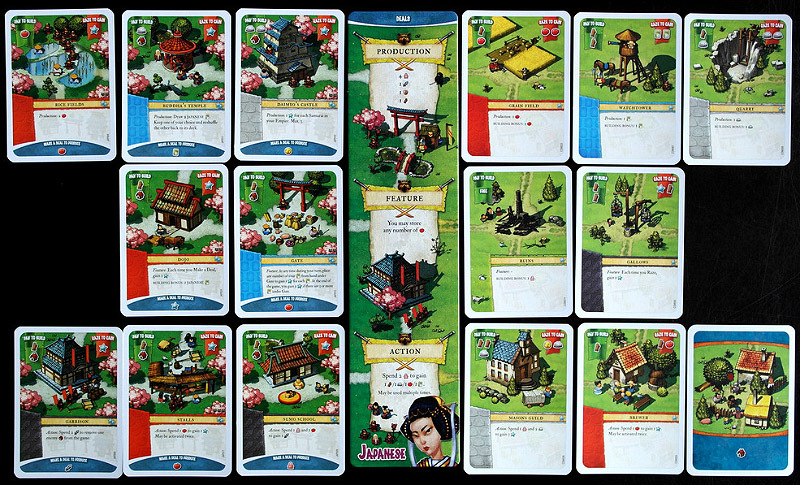 Attack cards are used to determine which player's Faction Location will be razed by the virtual player. The game lasts for 5 rounds divided into 5 phases each. The first 4 phases are the same as in the standard multiplayer game with the 5th phase being the virtual player's attack. Draw the top card from your own Faction deck and add it to your hand. Draw the top 4 cards from the Common deck, place them face-up in the center of the playing area, and choose one to take into your hand. Shuffle the remaining three cards and draw a random card for the virtual player. Place it face up in his playing area, opposite your Empire. Reveal the remaining two cards and choose one to take into your hand. Place the last card in the virtual player area, next to the first one. Perform these phases only for yourself. The virtual player does not receive any Goods nor takes any actions. In terms of actions and certain card abilities, treat the two cards the virtual player received in the Lookout phase as his Locations and the revealed Attack cards as your opponent's Deals. Note: When you raze a virtual player's Location, do not turn it into a Foundation. Discard the card instead. Take the virtual player's Location and set it aside on a Collection pile. 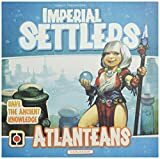 The cards in the Collection pile will be counted at the end of the game and their number compared with the number of Faction Locations in your Empire to determine the winner. Reveal the top Attack card and place it over the previously revealed Attack cards, so the Target field of each card is visible. The Goods depicted in the Target fields establish which one of your Locations will be razed by the virtual player. Note:The virtual player will raze a maximum of 1 Location. Check the type of Good in the first Target field (from the topmost Attack card) and search through your Common Locations for the ones that match the same Good in the Raze field. If you find no such card, nothing happens and you can proceed to the next round. If you find Locations with a matching Good, then check whether the Good depicted in the second Target field (from the previous Attack card) matches the other Good in the Raze field. If it doesn't match, check whether the Good from the third Target does, and so on until you find a Location to raze or there is no such Location. If there is no Location to raze, nothing happens and you can proceed to the next round. Note: Do not check every possible combination available. Check only the pairs consisting always of the first Target and the next ones in order. When you find a Common Location with a matching pair of Target Goods, then that Location is razed by the virtual player. Note: Once the target of the virtual player attack is determined, raze your Location. The virtual player does not receive any Goods nor is the Location turned into a Foundation. Instead, the razed Location is placed on the virtual player's Collection pile. If there is still more than one Location that meets these criteria, then the first Location razed is the one with the highest building cost on the card (in terms of number of Resources). If there is a tie in Location building costs, Stone is more valuable than Wood and the Location with more Stone in its cost is razed. If there are still Locations of the same value, then it's your choice which card will be razed. Move the two Attack cards used to determine the razed Location to to the last positions in the Target line - i.e. to the bottom of the revealed attack cards. Once both attacks are resolved, proceed to the next round (unless it's the last one). If you are using the Japanese faction, when the first Target of the virtual player is a Victory Point and there is another VP on any other Attack card, then the virtual player attacks a Faction Location. 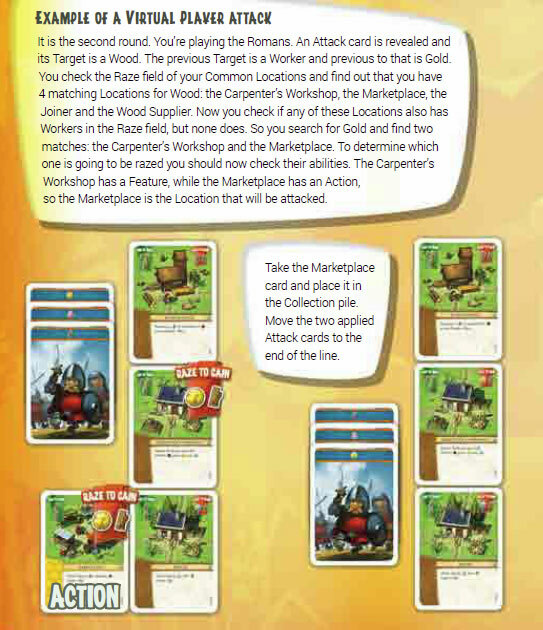 If you have more than one possible Faction Location to be razed, the virtual player will first raze the Locations providing a card in the Deal field or, in descending order: Raze token, Gold, VP, Stone, Worker, Food, Wood. If there is more than one card which can be attacked, then determine the Location by its ability or building cost, in the same way as described above. Move the two Attack cards used to determine the razed Location to the last positions in Target order. After the 5th round, count all the cards in the Collection pile of the virtual player. If the virtual player has more or just as many cards in his Collection pile as you have Locations built in your empire, you lose. On the other hand, if you have more Locations, you win and you should count the VP value of your Locations in the normal way. Add it to your Victory Points scored during the game so you know your final score and can try to beat it next time you play solo. Also, check how well youdid in the achievement table.